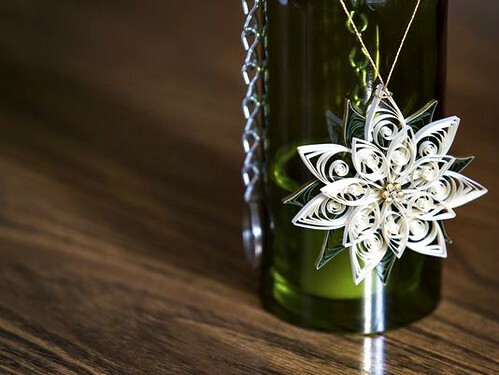 I'm looking forward to visiting the Morris Museum to see the newly opened exhibit, Pulp Culture: Paper is the Medium, where three of my quilled necklaces are on display through December 7. Since many of you are far from New Jersey and won't be able to attend, perhaps you'd like to see them. 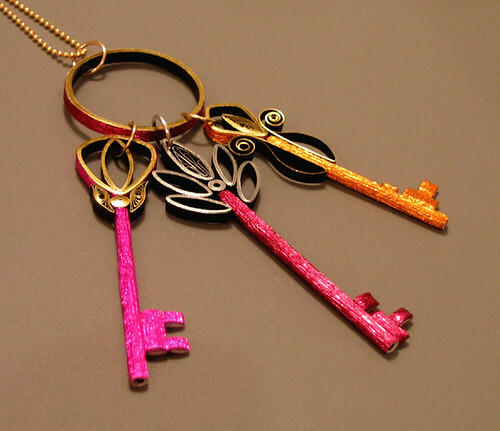 After a friend sent me some vibrant crepe paper that rolls beautifully, I was inspired to create a jazzy, wearable set of keys. It's a play on the Ring of Keys framed piece I made several years ago that was inspired by an antique Victrola key. Sometimes I make single key pendants... you'll find step-by-step instructions on how to make one of your own in the All Things Paper book. The exhibit curator also chose this design; I call it Silver Teardrop Orb. You can learn to make it too, via the same book. 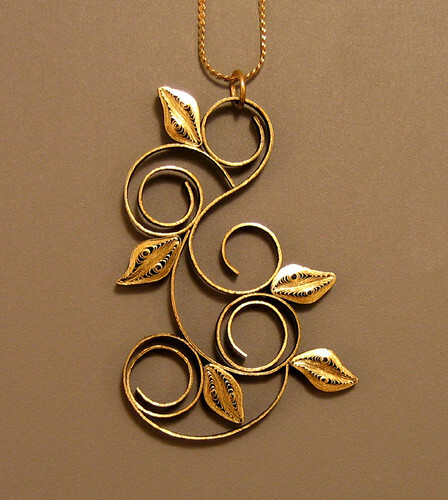 The third pendant is this golden design, Leaves and Loops. 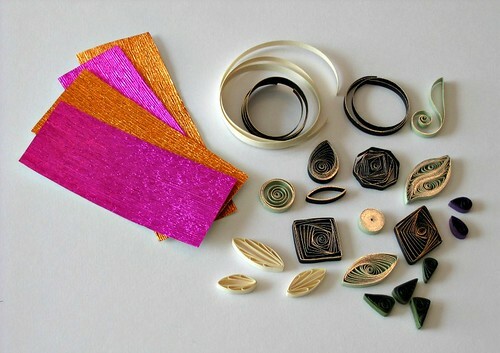 Morris will be hosting workshops for children during the show - there is a paper making class this Saturday, a tour for very young children in October, and paper collage and pop-up book classes in November. A local newspaper reporter recently did an article about my work in conjunction with the opening that you can read here. The photographer took this picture of a poinsettia ornament that he suspended on a bottle lantern that happened to be on the table... I think it's a pretty cool impromptu photo! These are artworks, Ann. Beautiful. Your work is superb and that is a wonderful article. I'm going to put this on my calendar of things to do this fall. Wow! Super gorgeous. Love the golden and leaves pendant. Very exquisite look! Congratulations on your exhibit. Your jewelry is fabulous! Fabulous Ann!! Love your leaves and loop pendant. 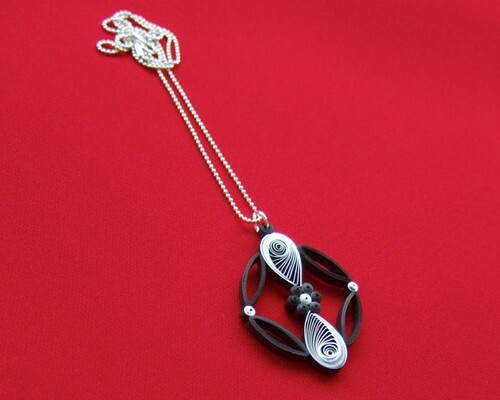 All the open loops make it look so fragile but your careful planning and gluing has made your pendant quite durable. Thanks everyone! Lorraine, I hope you'll get a chance to visit Morris. Suganthi, I made the loops with three stacked strips so it truly is durable. I'm so freaking stoked about your work being in a museum Ann! How exhilarating it must be! I do hope we'll see a photo of you standing next to your work on your blog soon! Congratulations Ann! Wishing I was closer to New Jersey! Well done, Ann! Congrats, on your gallery exhibit, Ann! The work is magnificent!